If you are a collector in the Chicagoland area, there was no shortage of events vying for your attention this weekend. In Rosemont, we had the gigantic Fanatics Authentics "Sports Spectacular" show with hundreds of vendors and enough former/current athletes being paid to scribble their name to fill a football roster. Meanwhile, the Chicago Comic and Entertainment Expo (or C2E2, for those in the know) was being held concurrently at McCormick Place (just south of downtown Chicago) and attracting another humongous audience. However large crowds make me anxious, giant card shows rarely provide anything of use to this ultra-niche collector and I did not have an acceptable cosplay to be seen at C2E2... nor am I much of a comic guy anyway. Thus, neither of these choices were overly appealing to me when it came to spending my Sunday afternoon. Collector Con is nowhere near the level of those other two, previously named conventions; however, with less distractions and no unofficial dress code, this seemed like the logical choice for me to search out new collector's items - aka baseball cards. As you can plainly see, this joint was hardly dead. Luckily, it was that perfect balance of quantity of vendors vs. potential customers and I didn't constantly feel like I was in someone's way. Perfection. As a Blackhawks fan and Chicago resident, this is clearly the wrong member of the Hull family in my eyes; that said, the fact that "Golden Brett" got his own comic book series piqued my curiosity enough to use up my freebie on this McDonald's promotion. Available for purchase at St. Louis-area McDonald's in 1994, what I have here is issue number one of four in a series where the younger Hull is sent into the future to fight hockey goon villains or some such goofiness. Real subtle there - I highly doubt Brett grabbed chicken nuggets from Mickey D's every morning as part of his game-day ritual. I don't think I could function with that much fast food in my system, let alone a professional athlete. Still, this was worth enough laughs for the price it came to me at (again, gratis). Whooaaaaaaaa - this was something I'd definitely never seen before. 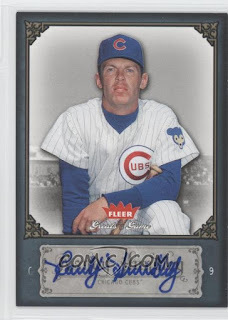 This in-person auto from the catcher of the infamous 1969 Cubs and the pseudo-contending Chicago teams of the late 60's/early 70's is on some sort of regional, newspaper sponsored card set. There is no copyright date anywhere, any indication of this was a Cub-centric set or otherwise and the back is blank. In short, I have no idea what the story is on this product and the internet hasn't proven helpful whatsoever. One thing the internet was helpful with though was identifying whether or not this was a genuine auto of the iron-man catcher. After examining some certified examples of his penmanship, I felt pretty comfortable that this was no phony. But, I was subconsciously cringing when I inquired on the price, as I expected a massive hometown markup. The cost? Five bucks. Five bucks for an autographed card from a seemingly rare, regional oddball of a local sentimental and fan favorite? TAKE MY MONEY!!1! Now, honestly, if that was the only item I found worth purchasing out of the entire convention, I still would have been a happy camper. Any new autograph I can add to my collection is quite welcome to this low-budget collector and oddball cards are the best cards. However, there was still ground to cover. Another autograph, this one of young Cubs arm Carl Edwards, Jr., who was just optioned to AAA Iowa a few days ago. The signature hails from the most recent edition of Panini's Donruss reboot and, unlike the base set, is quite visually appealing. The rainbow foil looks quite nice in hand and Panini did a good job here of hiding their lack of a license. While it may be a sticker auto, it's still a pretty card of a guy who doesn't have much in the way of certified product. I plopped down another Abraham Lincoln flash card on this one; probably an overpay, but still comfortably within my budget and, to be completely truthful, I just wanted to buy something else. Both of these inked additions will make for nice upgrades in my Cubs All-Time Roster collection. This will come in handy - I need something to hold up the shopping list on the refrigerator anyway. Morris is one of my fiancee's favorite places to spend a lazy weekend day and free just so happens to be my favorite price - I might just be able to swing this. Oh... and I guess Carlos May is pretty cool too, though I'm not usually one to pay for someone's autograph. So, all in all, this was an exceptionally awesome way to wrap up the weekend; two new autographs at reasonable prices plus a goofy, free comic book and I wrapped it all up with a plate of cookies and a rough n' tumble Blackhawks v. Wild tilt on the TV. I'll take that any day. Just another "conventional" weekend here in Chicagoland! Not bad, you got a couple of unique cards there to make it worth the trip at least! That's all I ask for in a show! 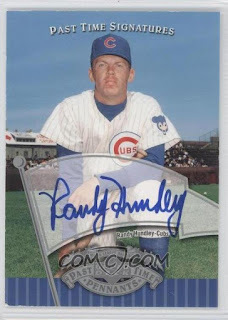 That Randy Hundley autograph is very neat. Also the card it is on, is really interesting. I'm kind of curious to know what kind of cardstock was used? It's kinda thin - pretty similar to matte photo paper, I'd say. Nice! Know of any shows coming up the first weekend of April, when I'll be in your neck of the woods? I do not at the moment; I'll have to do some research and get back to you. It's like they actually tried with the auto cards instead of settling for a mild rehash like they did with the base. A unique "Rebel" card with an autograph and the additional #9? No brainer. Pretty sure I'll never have one of those in my collection. Nice cards, but that sure is one hulluva comic book. Shoot, I wish I would have known about the Kankakee show. My in-laws love in K3 and it would have been nice hit a card show and see them at the same time. Morris? Nice! The south suburbs are less than 2 hrs time for me. Maybe I'll see you there? Also - Rolling Meadows and Schaumburg are having shows on the 3rd of April. 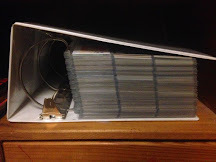 Come to think of it, trying to hit a card show in the Chicagobarea, looking for Cubs cards probably isn't the best idea, or is it? I'll be in Schaumburg that afternoon/evening.